These days, warehouses need to operate lean in order to stay competitive. This means working efficiently and cutting costs where possible. Often, workers think that saving money is a job reserved for management. In fact, everyone plays a role in helping the business manage costs. Saving money improves the bottom line, which makes for a healthy business. It can also boost job security and enhance safety. 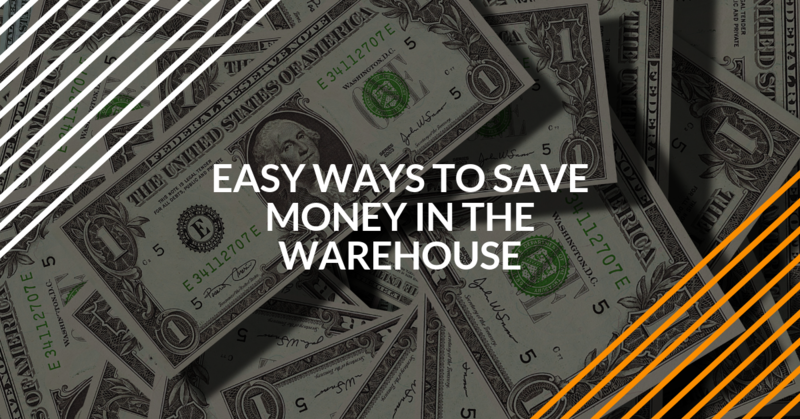 There are three broad areas for saving money in the warehouse. Each contains many ways to cut costs and work more efficiently. Tighten up inventory control. Sloppy inventory management is a major cause of wasted money. Barcode every item that enters your warehouse so you always know what you have and where it is. Remove all items with expired “use by” dates, and return all damaged items to the vendor as soon as you receive them. Switch to electric forklifts. These cost more to buy than forklifts powered by propane, gasoline or natural gas. But the fuel savings will quickly add up, reducing long-term costs. Stay on top of maintenance. Timely maintenance of forklifts and other equipment saves money by preventing future repairs. Follow manufacturer guidelines for inspections and tune-ups. Use software to track scheduled maintenance dates and repairs. Go green. Modern warehouse systems can use far less energy than in the past, but only if you keep up with technology. Products like energy-saving skylights and ceiling fans can improve work conditions for far less money. Strive for continuous improvement. Make saving money an ongoing process, not a random event. Look for ways to remove waste in the areas of time, motion and inventory. Reward workers for providing ideas that streamline work processes and save money. Reduce errors. Track errors that occur on a frequent basis. Find out what causes them. Then change work processes and/or equipment to reduce them. Focus on correcting errors rather than blaming the workers who make them. Maintain the proper climate. Storing warehouse items often requires a precise temperature range and humidity. Keeping the warehouse climate within the proper range can lower the cost of replacing spoiled goods or damaged products. Practice cross-docking. Excess material handling and storage increases costs. Cross-docking saves money by receiving goods at an inbound dock and quickly transferring them to the outbound dock to reduce handling and storage. Make smart use of your storage space. Better use of space lets you handle more product. Design your racking to fit the height and size of the warehouse. Using the right type of forklift for your aisle space will reduce the time it takes to move items. Invest in energy-saving technology. Energy costs can be reduced with the latest in timers, sensors and lighting systems. This includes replacing standard light bulbs with energy-efficient bulbs. Smart use of paint colors and windows can use natural light to reduce lighting costs. Use digital time tracking. Manual time tracking is slow and prone to human error. Tracking worker hours with your warehouse management system can reduce labor costs by 20 to 30 percent. Schedule smarter. A software scheduling program can help limit or avoid the costs of understaffing and excess overtime. Cross-train all employees. Having workers who can fill in for each other reduces costly downtime when people are sick or on vacation. Use contract labor when needed. You can save money by hiring workers on a contract basis during peak production or seasonal periods. This avoids over-staffing and cuts down on the cost of insurance and other benefits. Above all, make sure all forklift operators are properly trained and certified. This will improve productivity while reducing accidents. It can also save thousands of dollars in OSHA fines from not using certified workers. If you’re serious about saving money and improving safety, visit ForkliftCertification.com, the leader in fast, affordable online forklift training and certification. We’ll help you save money and promote workplace safety by training your entire team to OSHA standards. Call us today at (888) 278-8896, or visit our contact page to learn more.